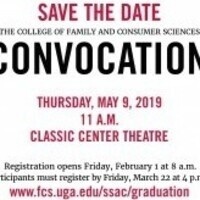 FACS Convocation is a more personal ceremony for College of Family and Consumer Sciences graduates to be recognized individually on stage. Guests are invited to attend. The event is free, but registration is required for graduating students to participate.